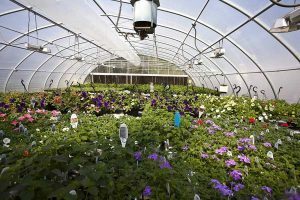 Students with an interest in plants, flowers, trees and everything green come to TCC to study horticulture and prepare for a variety of careers from landscape design to greenhouse management. The horticulture curriculum ranges from Principles of Horticulture to Greenhouse Crop Production to Chemicals in Horticulture to Arboriculture to Landscape Construction and Maintenance. Students can earn an associate degree or certificate with specialties in plant production, landscape design or landscape management. In addition to lectures, labs and working in the greenhouses, students expand their learning by touring local nurseries, listening to guest speakers and participating in study abroad opportunities. “Every other year we visit Central American hot spots like Costa Rica, Panama and Honduras. While there, tour marketplaces, coffee plantations and flower farms, and learn that horticulture is a global industry.” Most recently, while in Guatemala, students toured the 100 acre Paul Ecke poinsettia greenhouses in the shadow of the Fuego Volcano. Most of the poinsettias grown in the United States come from this facility. Karyn Smith, a second-year student who plans to graduate with an associate degree next year, says she is well prepared for the work ahead. “It’s been a tough program. They teach you everything you could possibly need to know to hit the ground running.” An avid gardener, Smith plans to move to Charlottesville to work at Thomas Jefferson’s Monticello. She is currently a work-study student, caring for plants in the TCC greenhouses.